Vaughn, I hope you miss your goal of 77 and make it to 95. Congratulations! Dan, I’m inclined to agree with you… I think 86 would be more appropriate and my speed. Plus, the meaning of 86 is far too ironic for me to miss the mark! Thank you so much, Rania! I appreciate the kind words and support. Hi Vaughn. I’m just glad we’re part of the handful of survivors out there. Your story is so similar to mine except that your hemophilia is mild and mine is severe. You’re athletic while my joints are decayed due to frequent bleeds over the years. I commented on the story of your daughter Trinity. But it bares repeating. I was born with Hemophilia A, in 1982. 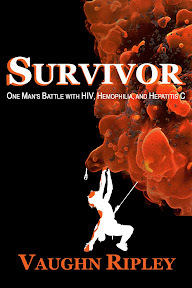 Diagnosed with HIV in 1986. I still infuse prophylactically three times a week and I’m also at undetectable levels due to a good cocktail. Man that slight difference in Hemophiliac severity makes all the difference. I envy you a lot Vaughn. Take care of yourself, your family and those joints. I truly do hope you compete in 100 triathlons. Really awesome to have you here on the site and getting your valuable input. Thank you for dropping in and commenting. Keep your chin held high, brother! it is so inspiring to read Your posts. 25 years ago my father died from AIDS and he was 39. today I am a mother of a 4-year-old hemophiliac and he is also mild so when I see You living Your life to the fullest I feel so happy, full of hope for my child. THANK YOU VERY MUCH!! What a tragic and amazing story, Dinka. Thank you so much for the kind words. I try with all of my heart to inspire and lead by example.